U Khin Nyunt and his wife Daw Khin Win Shwe. Note: This photo isn’t exhibited in the gallery – it’s in one of the conservatories dotted about the gardens. Sipping a latte in a residential compound that belongs to someone once considered the most powerful and feared man in Myanmar – and who spent seven years living there under house arrest – is one of the most surreal experiences Yangon has to offer. This is perhaps all the more so because the compound itself is anything but grim: the place is a green oasis. 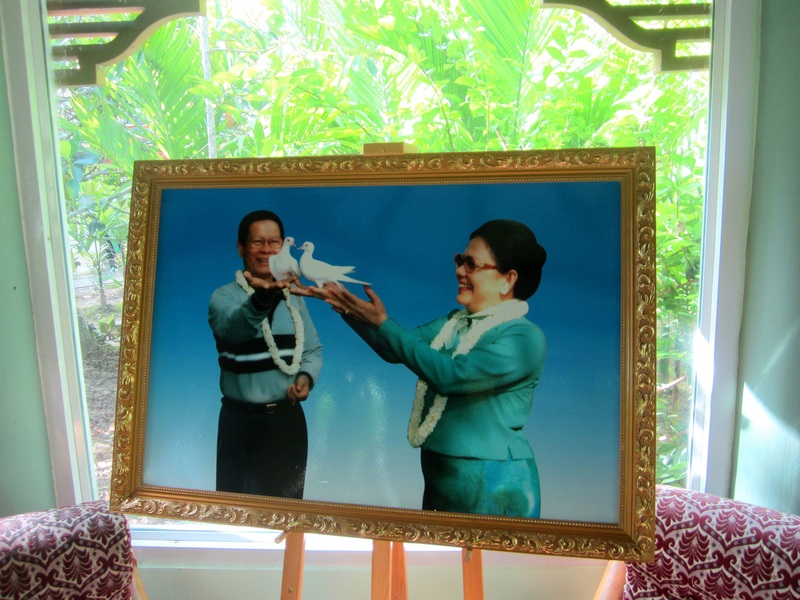 The former prime minister and chief of Military Intelligence, U Khin Nyunt, opened Nawaday Gallery on his sprawling property a little over a year after his release from house arrest in January 2012. The gallery is set in lush gardens which feature miniature bridges, pebbled fountains, goldfish ponds and his beloved collection of orchids. Dotted around the gardens are three small shops selling fairly run-of-the-mill souvenirs, as well as a coffee shop with both upstairs and downstairs seating areas. Whilst visitors may be enticed by the prospect of seeing U Khin Nyunt in the flesh, the chances of this are slim to none. The gift shops are run by his wife, Daw Khin Win Shwe, while his son, Ye Naing Win, oversees Nawaday Coffee Corner, which is a branch of Café Aroma. 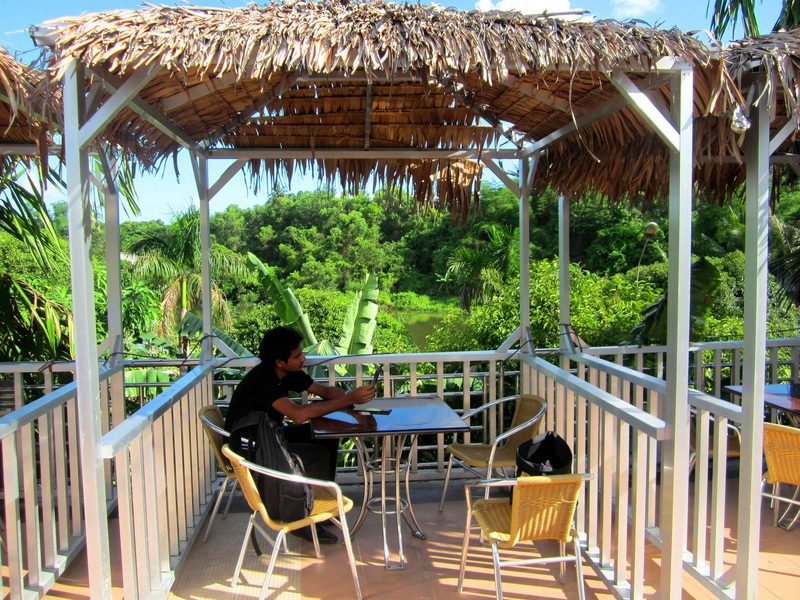 Each of the dozen-odd tables in the upstairs coffee lounge are shaded from the sun by kitsch bungalow style thatched roofs. The view to the east – just across Nawaday Road, is an expanse of water so wide in breadth (not to mention southward flowing) that it took my husband some time to convince me that it’s not an actual river. The “lake” is surrounded by a steep hill thick with wild jungle growth – the only sign of human encroachment was an odd-looking boxed structure at the top. Was it a sentry point in days past, I wondered? That’s the thing about Nawaday Gallery – no matter how many birds are chirping and flowers blooming, it’s difficult to feel completely at ease. While soaking up the serenity as the lone rooftop customers (while the only other visitor sipped coffee downstairs), we marvelled at how U Khin Nyunt’s fortunes have changed (though perhaps not in the literal sense of the word) and the sheer fact that “The Prince of Darkness,” as he was known, was likely relaxing in his home about 30 metres to our left. The only visible signs that remain of U Khin Nyunt’s years under house arrest, it seems, are the enormous steel roll-back gates a few metres up the street and a dilapidated sentry box to the left. “It certainly isn’t the worst place to be stuck in for seven years – and I even heard that he and his wife were allowed to travel abroad sometimes,” I said glibly. My husband laughed nervously and we found ourselves looking around for CCTV cameras and even wondering whether the coffee shop was bugged. Was it pure paranoia? 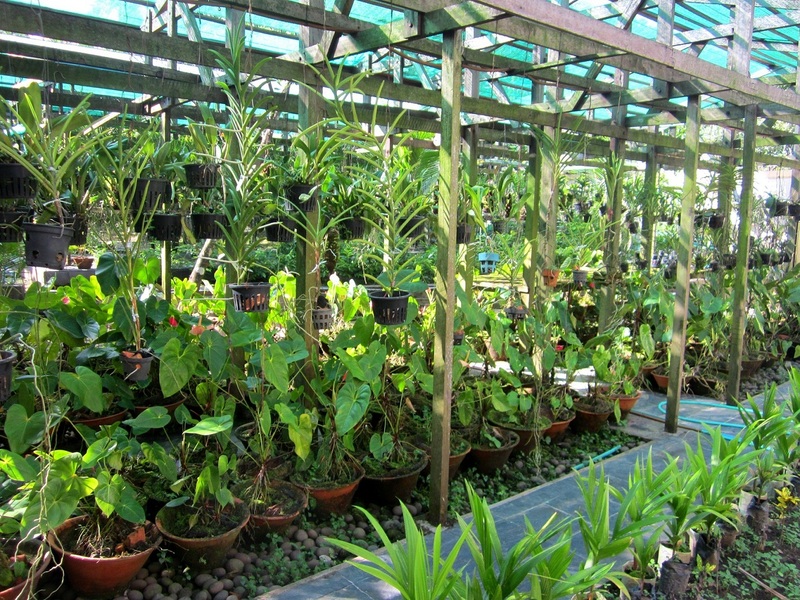 To a degree: I later discovered that when U Khin Nyunt was interviewed by The Wall Street Journal in 2013, the journalist noted that the centre of his living room contains a computer screen with 16 mini-displays that alternate between different views of the compound. Nonetheless this does not mean that visitors are subject to a sinister form of scrutiny – only a fool would be lax on security, and U Khin Nyunt, who was regarded as the regime’s most pragmatic international strategist, is obviously anything but. I am grateful, however, that I resisted the urge to take a closer look at the black Hummer parked out the front of his villa by walking a few steps up a brick staircase that divides the public area from his private residence. The gallery showcases local artists for a week at a time and doesn’t charge for the exposure it provides. The criteria for selecting artists is simple: first come, first served. U Khin Nyunt’s stated goal is to help artists make a living out of their creativity, which is without a doubt a worthy ambition. An artist called Nang was hosting an exhibition on the day of our visit; some of whose works were quite lovely, whilst others, such as a handful of clumsily depicted mermaids, were less so. 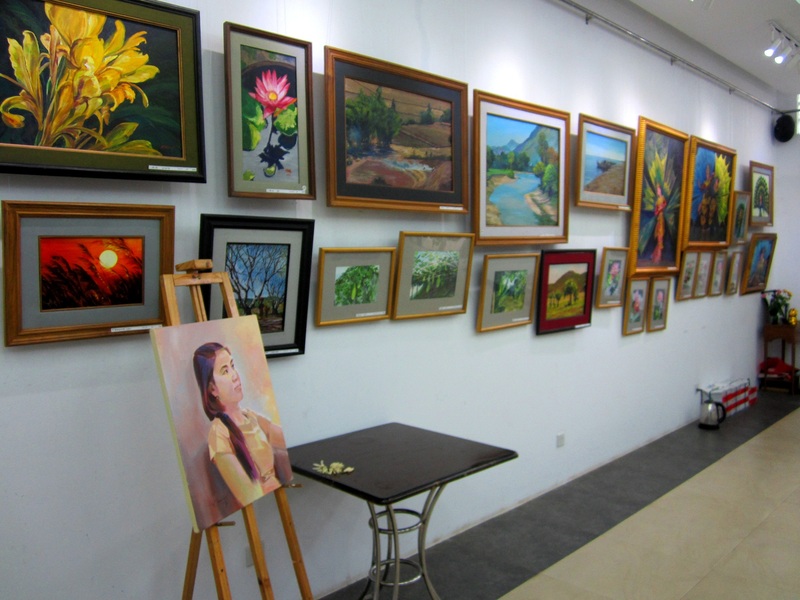 However I did note that in comparison with the majority of other galleries in Yangon, prices were extremely reasonable at around K100,000 for a medium sized framed painting. 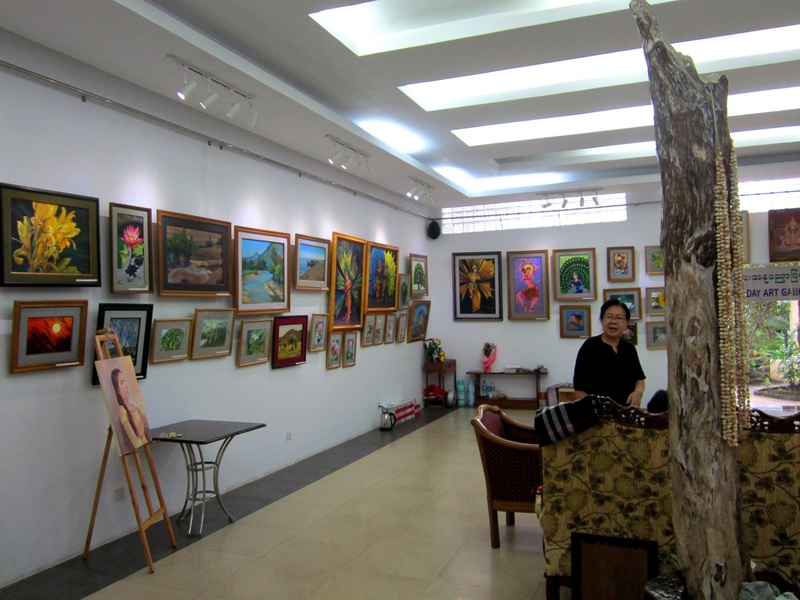 Nawaday Art Gallery is located on 27 Nawaday Street, Mayangone Township. It is open daily from 9am to 6pm. For more information, call 09 4399 898 or visit the Nawaday Art Gallery Facebook page. Fascinating to hear about the former MI chief’s efforts to lead a (seemingly) politic-free life. Thanks for the report! I did recall that, sometime last year, Khin Nyunt said in an interview he’d like to be involved in “amyothar politics” — a phrase that doesn’t translate well into English, but it refers to politics concerning public welfare, rural development, culture preservation, and so on, which is distinctly different from the branch of politics that deal with diplomacy, international relationships, party forming, and parliamentary aspirations. I sometimes wonder if the former MI chief is testing the waters and simply bidding his time for a return to the inner circle of power brokers.